A few short years ago, in an age long before the multiple cell phone storage cabinet, it was common courtesy to turn off your cell phone or pager during a public performance, a seminar, or a conference. Not everyone complied, however, and the beeping or ringing would become disruptive. Within short order, the venues themselves were politely asking you to power off before the event was underway. Today, of course, it’s a whole different ballgame. Today’s cell phones are equipped with high resolution cameras and video recorders. Growing concerns over privacy and the intrusive reality of today’s modern cell phones and other handheld devices have caused many public and private establishments to ban cell phones completely. From lockers rooms and classrooms to casinos, churches, hospitals and government buildings, it is not uncommon to find cell phone storage lockers in widespread use today. The list of establishments that ban cell phones altogether is growing and may include theaters, recreational centers, prisons, military facilities, and even financial institutions, among others. Mailbox works carries several types of multiple cell phone storage lockers for sale, manufactured by Auth Florence Manufacturing. Both front and rear loading models can be surface mounted or recessed and both can be ordered with additional options such as engraving, name slots, mail slots, or combination locks. Each 4” x 5” compartment has its own 5-pin cylinder cam lock and each comes with two keys plus optional wristband key chains. The “A” door style, multiple cell phone storage cabinet is wall mounted (available in 4 inch or 7.5 inch depths) and commonly found in places like office buildings and government institutions. Sometimes wall mounting is not an option. In this case, the pedestal mounted cell phone storage cabinet by Auth Florence Manufacturing can be the solution you are looking for. The storage compartments are 15 inches deep with 5” x 6” doors and come in 8, 12, or 16 door configurations. Each storage compartment comes with 3 keys and all compartments can be accessed simultaneously through the secure master lock on the rear hinged master door. The pedestal cell phone storage cabinet is a non-returnable custom order only and the pedestal is optional. The pedestal cell phone storage cabinet is available in anodized aluminum or in a variety of powder coat finishes including black, gold, and medium or dark bronze. They can be used to store cell phones and other electronic devices, plus small personal effects like keys. 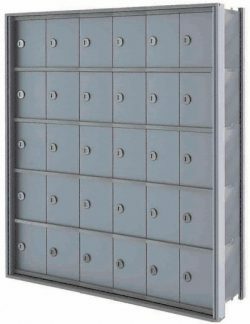 For more information about recessed or surface mounted cell phone storage lockers or about the pedestal model by Auth Florence Manufacturing, please contact MailboxWorks toll-free at 1-866-717-4943 or Contact MailboxWorks. MailboxWorks also sells commercial and residential Mailboxes.